Since those posts, I’ve continued to run Postmatic – I’ve been through every single release of the beta, I’ve been through the release candidates, I’ve experienced the bugs that come with it (and I know some of my readers have as well – thanks for the tweets on those, by the way :), and I’ve been through their resolution. To say that I’ve not experienced each hill and valley of the business as a customer since last November is an understatement. The fast turn around and direct communication with Jason and the rest of the development team couldn’t be better. Other companies could take note, but that’s another post for another day. Today, Postmatic has officially hit 1.0 and I couldn’t be more excited for the team. Personally, I use vanilla comments (which is obvious) and Postmatic plays nicely with that particular form of commenting. But what is Postmatic, anyway? Commenting in WordPress is an untapped opportunity. Increased blog engagement raises seo performance, strengthens your brand, and builds a community around your ideas. But commenting is confusing. What if it could be easy and familiar, just like email? There are two versions of the plugin – free and paid – both of which offer great options regardless of the type of blogger you are. Anyway, enough rambling about how I’ve used it and what it is and all of that. When it comes down to it, is it really worth looking into yet-another-commenting system for WordPress? If you tend to run your life out of your inbox, then Postmatic makes it easy to keep up to date with the comments on your blog, follow up with them, and even get into a deeper discussion than normal because your readers are likely using the email comments, as well. For those who use Markdown, it still works within the context of WordPress comments so you don’t have to sweat losing that feature. The comments are still kept in your dashboard so if you need to do back and edit a comment, delete a discussion, or generally administer a discussion, you’ve got the ability to do so as if the comments never took place outside of WordPress. You can theme the email template to map the theme of your blog so users get a cohesive experience. If you use another service such as Jetpack, Mailpoet, or MailChimp, Postmatic will successfully import all of those subscriptions so you don’t lose anything. Some of us care deeply about privacy (and Postmatic does, as well). And there are plenty of other features all of which I think are worth reading, but these are the ones that have been most relevant to me. 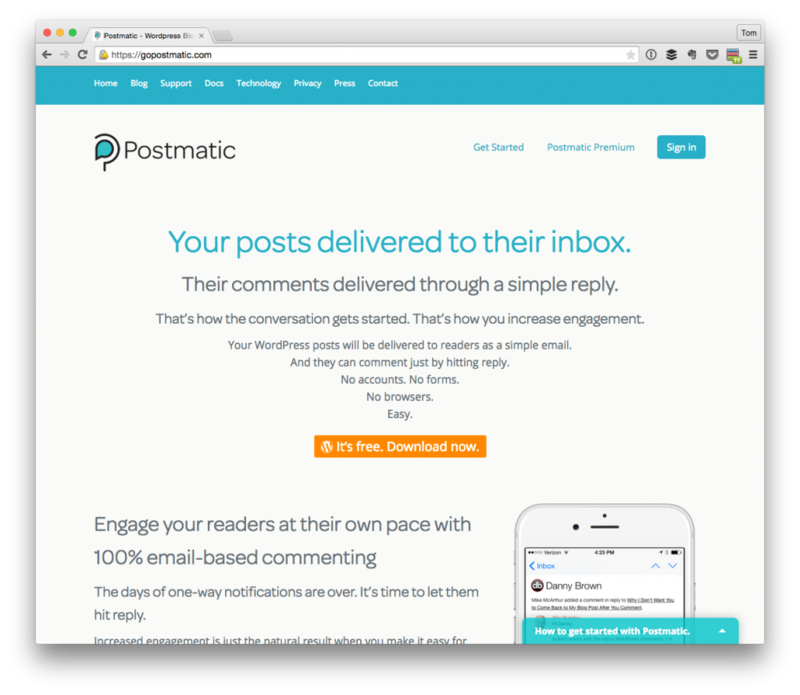 Anyway, for those of you who are looking to maintain the vanilla WordPress commenting experience, increase discussion on your posts, and continue to do so without hopping back and forth between your day-to-day work and your inbox, I highly recommend Postmatic. I’ve been using it since the early beta stages and continue to treat it as one of my favorite plugins. Thanks as always for your support. We love being part of the conversation here on your site. Here’s to the future! Wow – I had no idea. I sat watching the video with my hand over my mouth having no clue that that’s how everything went down. Bahahaahha yes. It will forever go down as one of the great moments of our early beta. That combined with your host refusing to talk to our api, refusing to listen to cron, and cloud flare refusing to let us get to your site. It was quite a week! You earned the name Mystery McFarlin, or just Mystery for short. Thanks for pushing us to be better, friend. I love the plugin – been using it daily (as I’ve mentioned) and don’t see myself going back. Can’t wait to see what you guys have planned for the net version. If there are any hiccups I can provide, please do let me know ;). I have been very intrigued by your use of Postmatic … do the comments still post to your blog or do they remain private? I like the lure of it after dealing with the Spam involved with Commentluv … but I loved the community around CommentLuv and would think using the emails would accomplish not only a better sense of community but of deeper connection between author and commenter. I’m just starting my blog up on my new(ish) site so I might have to give it a closer look. Do the comments still post to your blog or do they remain private? They post directly to the blog as if you (or I) entered them within the WordPress Dashboard or the comment form. I’m just starting my blog up on my new(ish) site so I might have to give it a closer look. Obviously, I’ma fan, but I also think people should use what makes them happiest and most productive with their blog (Postmatic does that for me ;). I think I’ll definitely be checking it out! Thanks for answering my questions! Tom Do the comments still post to your blog or do they remain private? Reply to this email to reply to Tom. Here’s a recap of this post and conversation: Why I Use Postmatic For WordPress was published on April 29, 2015 by Tom. There were 6 comments previous to this. Here is this reply in context: Katrina Moody I have been very intrigued by your use of Postmatic … do the comments still post to your blog or do they remain private? I like the lure of it after dealing with the Spam involved with Commentluv … but I loved the community around CommentLuv and would think using the emails would accomplish not only a better sense of community but of deeper connection between author and commenter. I’m just starting my blog up on my new(ish) site so I might have to give it a closer look. Reply to this email to reply to Tom. Leave this conversation To no longer receive other comments or replies in this discussion reply with the word ‘unsubscribe’. Sent from Tom McFarlin. Delivered by Postmatic. Sorry about the reply text showing up and Katrina’s comment. Something has changed in the last few days with a few major email providers and we’re trying to play catch-up. Will have a fix out as soon as possible. Postmatic is totally compatible with CommentLuv. You can run the two side by side. I’ve just started down the world of serious blogging. Remember how overwhelmed you felt at the beginning? Yep, that’s me. So I opted in and got the premium version and I’m kind of excited. So would you recommend still having a separate email service like Mailchimp? Or would you just use Postmatics? I’ll read through the other comments, incase someone talks about this. I’ve just started down the world of serious blogging. Remember how overwhelmed you felt at the beginning? Yep, that’s me. It’ll fade with time :). I opted in and got the premium version and I’m kind of excited. So would you recommend still having a separate email service like Mailchimp? Or would you just use Postmatics? Postmatic also sends new posts to your list. That’s an important part of what makes the service raise engagement levels – meeting your audience where they are. As far as sending posts via Postmatic vs a newsletter via Mailchimp: it really depends on what kind of content you are publishing, Desiree. Is it newsletter kind of content, or more personal and traditional blog material? You could also think of it this way: Are you publishing content which is going to generate thoughtful conversation…. or are you instead just spreading information? Postmatic is for conversation. Mailchimp is more of a one-way street. Thank you guys, much to think about! Right, right – I was totally not thinking in those terms (hence the obvious oblivious response :). You gave a better answer than I did so thanks for chiming in, Jason! Ehhh, I gave you the week between holidays pass. No problem man. I hope you’re having some nice quiet time off. Enjoy the weekend. Considering switching from Disqus to Postmatic, really curious about the mailing list post and comment replies, I don’t see that Postmatic integrates with SendinBlue mailing list, and I have 25k subscribers there, so would hate to not be able to integrate it. I notice you don’t have the Facebook/Twitter API integration to allow for login to those platforms to leave comments via Postmatic, any particular reason? I don’t see that Postmatic integrates with SendinBlue mailing list, and I have 25k subscribers there, so would hate to not be able to integrate it. I don’t think that it does, but I can’t be certain without talking to Jason (I’ll mention this comment to him since he’s the guy behind Postmatic). I use MailChimp, so I’ve not considered it – but I don’t blame you. I’d hate to not be able to integrate the two! I notice you don’t have the Facebook/Twitter API integration to allow for login to those platforms to leave comments via Postmatic, any particular reason? I tend to be a fan of native comments, I’ve flirted with turning comments off completely, and I’ve never really heard anyone who reads this particular say ask for me to turn those features on. But that’s just this site and those are just my reasons. Don’t let it dissuade you. I checked out your site and you’d be someone who I’d understand having something like that on :). Our integration with SendinBlue is, at this time, one-way. 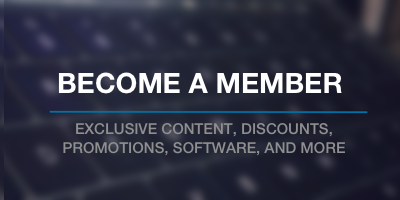 That means if someone subscribes to your site via Postmatic (either a comment, or to posts or digests) we can fire off a subscribe command to SendinBlue to have them added to that list as well. However, the opposite is not yet true: If someone subscribes to SendinBlue they cannot be subscribed to Postmatic. Yet. It’s coming in the future, though. As far as importing your 25k existing subscribers into Postmatic – that is something our support team could help you with if you want to do so. Be in touch. Next PostNext Want a Free Copy of WP Pusher?